hen she has time to kill, Kelley Barrett likes to scour Craigslist, the popular online classifieds network. She posts free items on the website, she says, mainly to keep her small Arcata home uncluttered. One night, about a month ago, she was cruising the real estate pages just for fun — "It fascinates me that people sell their homes that way," she explained — when she came across a listing that stunned her. It was a photograph of her Alliance Avenue trailer. In abject disbelief, she saw that the advertisement was offering the Arcata Mobile Home Park, where she lives, for $1.7 million. With developers across the country drooling over large parcels, particularly in coastal areas like California and Florida, mobile home park buyouts are attractive ventures. It's a reality of a swollen real estate market that leaves trailer residents in a vulnerable position. Often, the sale takes one of two routes: Either an investment group buys the property and jacks up the rent substantially, or a developer gets it and forces everyone out to build condos. For some trailer park residents whose land might literally be sold from under them, the threat of homelessness is a real possibility. Barrett understands the risk. Like many mobile home residents, she owns her trailer and rents the space beneath her. Not many places would likely let her relocate her 1960s-era trailer to their park, she believes, because it is considered too old. Newer, fancier manufactured homes, some two stories high, can cost upwards of $100,000. Buying new is not an option for Barrett, who is disabled and surviving on $8000 a year in social security. But the 43-year-old is also dauntless and smart. Before she became ill years ago she founded two nonprofits, so she knows how to find solutions — and money. After the shock of the news wore off, she immediately called Jean Schoonmaker, the owner of Arcata Mobile Home Park. Yes, it was all true, Schoonmaker told her, the park was for sale. She put it on Craigslist in hopes of attracting an out-of-town buyer, she said. That prospect scared Barrett. "There is no rent control here," she said. "So if a landowner sells their park for a couple million to an investment group, the investment group could turn around that day and quadruple the rents." She did the math and figured out that rents at the park — with its 33 narrow, rectangular homes — will likely climb from $250 to at least $600 if the place sells for the asking price. About one week before Barrett made her online discovery, a couple moved in next door after signing a mortgage for a $36,000 trailer. When they found out that the place was on the market they were furious. Had they known they never would have moved in. So once again, Barrett began combing the Internet. What she found next is something she believes to be the best hope for the residents of her trailer park: an unconventional but willing buyer, the Sacramento-based nonprofit Resident Owned Parks. "It makes real the idea that you can be on a fixed income and still afford to become a property owner," said Robert Hurney, resident-manager of the Sandpiper Park for the past three years. he Sandpiper Park sits snugly on just over half an acre at the end of G Street where the road bends into H Street, before swooping past an entrance to the Arcata Marsh and Wildlife Sanctuary, the much beloved hangout for birds, birders and homeless people. 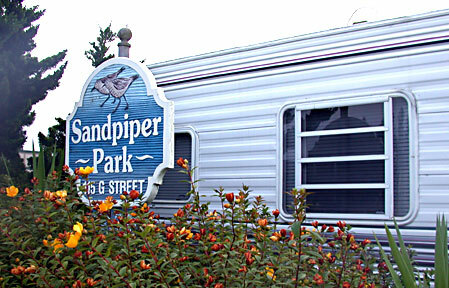 Nineteen of the 20 spaces at the Sandpiper are filled with fifth wheels and recreation vehicles (RVs) with names like Wildwood, Dutchmen and The Wanderer. Sandpiper owners Sue and Warren Morton of McKinleyville have had the park for 20 years and have conscientiously kept rental rates low ($250 a month) and the quality of life high, simply because they believe it is the right thing to do. "To me it is more important how you made money rather than how much you made," Warren said. To fulfill the latter part of their mission the couple screens every applicant, performing a credit check and inquiring with prior landlords. Sandpiper dwellers say the Mortons' level of scrutiny is unusual for trailer park owners, who normally let almost anyone with cash move in, but they say they're glad their landlords are choosy because it creates a better community. "People live there who possibly could not live in Arcata otherwise," Sue Morton said at a July 5 meeting of the Arcata City Council. The City Council had placed the future of the two mobile home parks — the Arcata Mobile Home Park and the Sandpiper — on the agenda for that meeting. The city's political leaders and staff had brought the issue to the council to seek a cooperative arrangement between ROP and city government, which faces a mandate to supply affordable housing. One Sandpiper used the occasion to laud her landlords. "Hi, I'm Betty Williams and I proudly live in a trailer court," she said with a chuckle. "I had a choice of other places but I chose this one because of the way Susan asked my landlord about me... I am handicapped. I am on a limited income but I am proud to be there and I am proud to rent from these people. They stood up for us." Many of the Sandpiper's residents express a similar gratitude toward the people who have turned a run-down trailer park into a vibrant and cooperative community. As for that one vacant space on the property currently, Warren Morton said it could be filled easily, but he'd simply rather leave it empty for now because a special person, like a Peace Corps volunteer, might need a place to live. "Our priorities are for people of greater merit, not money," he said. Sandpiper residents have included university students, two PhDs and a retired IBM employee. When the couple bought The Sandpiper in the '80s, Sue Morton said it was the "worst slum in Arcata." RVs were stacked two to a space, drug busts went down and tenants rarely paid rent. The management didn't seem to care much. By all accounts, the Mortons have since made it a happy place. "It's a good example of what a community should be," said Rob Hurney, a retired millwright who lives in an older model RV. "There is never any trouble. I've never had to call the police for anything." One tenant who preferred not to be named once upon a time was working as a registered nurse, living in a 4-bedroom house with trees in the backyard. Then a back injury put him on disability and into the low-income bracket. So he bought a trailer and moved to the Sandpiper. "It's a great place and it was a life-saver for me," he said. Health problems are also forcing a change of lifestyle upon the Mortons. Sue was diagnosed with breast cancer in October. "It's as severe as it gets," Warren said. Soon neither of them will have the time or inclination to deal with the park. The Mortons have received numerous offers for the Sandpiper over the years. Even the City of Arcata actively looked into buying it for redevelopment, but backed out when they realized how costly it would be to pay for the relocation of all the residents who would be displaced — a mandate required of any governmental agency that forces tenants to move. Some potential buyers wanted to build apartments on the property. Another wanted to build a bistro. 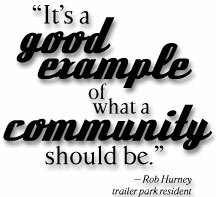 But the Mortons want to keep it as it is — an affordable mobile home park, which has always been Sue Morton's intention. So, in March, the couple contacted Resident Owned Parks President Maurice Priest and began negotiations. arlier this month, Priest approached the City Council with a proposal — if ROP buys both the Sandpiper and also the Arcata Mobile Home Park, they want financial assistance from the city. In return Arcata benefits by fulfilling its state-imposed mission to provide affordable housing. "There are a lot of things to be worked out but I think this is a good opportunity," said Elizabeth Conner, director of the Humboldt Bay Housing Corp., at the July 5 Arcata City Council meeting. "When we passed the Housing Element, mobile home parks were identified as one of our key strategies for providing affordable housing. It's an important part of our continuum of care. So if these mobile home parks are for sale and the mortgage is going to go up, we need to find good solutions, and this nonprofit seems to be a good one." Conner said later that if the city does not follow up on the Arcata Mobile Home proposal, her organization would be willing to step in and make an offer so the park is not lost to a developer. ROP is asking Arcata for three things: generally speaking, money, money and money. Specifically, they're requesting $155,000 to fund the Sandpiper deal and $250,000 for the larger Arcata Mobile Home Park. ROP will make a 3 percent profit from the deal. Each sum will be split three ways: one, for funds to help with closing costs; two, for tax credits that will provide an incentive for the owners to sell to the nonprofit rather than any other investor; and three, for rental assistance to subsidize the rent increase that will occur when the nonprofit purchases the parks. Although the Mortons' desire is to keep rents low, rent at the Sandpiper will go up substantially for some of the residents — from $250 to around $385. That will be the total necessary to cover the new mortgage payment and maintenance of the park. But once the new rent is implemented, it will be locked for the next 30 years — rents will rise a maximum of 1 percent per year. In a survey of Sandpiper renters, ROP found that 11 residents out of 19 would qualify for a rent subsidy from the city. For some residents, like Les Cook, that means he'll probably "drive away and never come back." Not that he has any hard feelings. Cook, who is retired from IBM, is on the upper end of the income scale. He describes himself as an "itinerant nomad," traveling up and down the West Coast in his tidy 24-foot RV where he even stows a "wine cellar" under the floor. For the past three years the 74-year-old has split his time between Hollister and Arcata. So when the rent goes up, it won't be worth it anymore to reserve his space at the Sandpiper while he's away. "Once they turn it over, there will be a lot of people here who won't be here anymore," he says. But he doesn't mind, he says, because other people need affordable housing more than he does. He'll just find another place to park his rig. The Mortons figure it is still a good deal, even for those higher income people who get no assistance. The tenants will be building equity and capturing a little piece of the American dream — land ownership — that typically eludes trailer park residents. They are often at the mercy of their landlord's whims, which can include frequent rate hikes, retaliatory evictions or strange rules, as in the case of one Eureka trailer park whose managers require cats to be leashed when outdoors. "I could rent those spaces for $1,000 a month if I said, `No questions asked,'" Warren Morton speculated. "I could fill it up easily with [undesirable] people. They would pay $1,000 and wouldn't complain. But the rest of the community would complain. And what it does is drives up housing for people who could really use it. That's what I don't like. We have to have housing for people who are normal people. You have to have it." It all adds up to a problem for people seeking affordable housing. But even with its high-cost homes, Arcata is making progress in creating affordable housing. Larry Oetker, deputy director of redevelopment in Arcata, explained that if the city can strike a deal with ROP it will be close to meeting its goal to produce 115 affordable housing units by 2010. (Generally speaking, "affordable housing" accounts for 30 percent of one's income, Oetker said.) Currently, 51 units are in the works. Add another 50 mobile home spaces and Arcata is almost there. "I think we are in fact meeting some of the need," Oetker said, "but there is a lot more need to meet." Another bonus that Arcata is looking to provide to mobile home owners is the ability to be part of the city's first-time homebuyers' program. Currently, trailers are not included in the program, but they could be in the future, so new trailers could be bought at an affordable price. From the city's way of thinking, trailer parks will then become more aesthetically pleasing to park residents as well as the larger community. 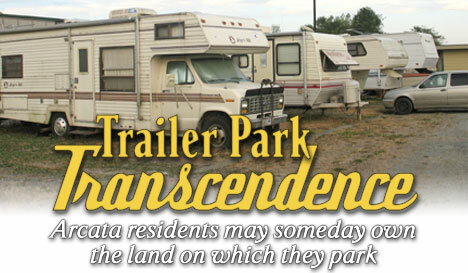 In other areas of the country, resident-owned trailer parks have been successful. In New Hampshire, a Community Loan Fund has helped mobile home residents purchase 72 parks between 1984 and 2005. A University of New Hampshire study suggests that the loan program "...provides an important vehicle for increasing the stock of affordable housing in New Hampshire and that those living in the purchased parks benefit economically and socially from being able to purchase the parks." On Aug. 2 the city will hold another public hearing and possibly decide whether to give Resident Owned Parks a green light on their proposal. Above: Arcata Trailer Park, photo by Helen Sanderson. f 78-year-old Dinah Black had to move from her home now, she's not sure where she would go. She lives two trailers down from Kelley Barrett at the Arcata Mobile Home Park and, like Barrett, she believes that no one would take her trailer — a 1974 two-bedroom model — if she were forced to move. She's lived on Alliance Avenue for 23 years and she can't quite imagine being somewhere else. It irritates her that "big guys" would make her move to build their condominiums. "I hate people that's greedy," she said, popping an Altoid mint into her mouth. "They don't give a damn about you. I feel sorry for people in that state of mind." Already she has had two heart attacks and wonders how much more she can take. But that's the name of the game. Even the Mortons, with their saintly mission to provide a peaceful place to park, said that if this deal with ROP does not work out, they will sell to an investor. Cancer, Sue Morton told the City Council, changes your perspective on things. "If it doesn't go to ROP it will go to someone who will gentrify," she said. 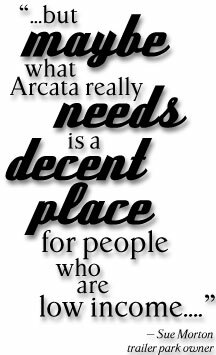 "And maybe gentrification is nice, we all like things to be nicer, but maybe what Arcata really needs is a decent place for people who are low income — really low income, not $50,000 a year." Back at the Sandpiper, Rob Hurney sits with his back to the sun in the corner of the lot near the Arcata Marsh. He considers what will happen to the place he's grown to love. "I would like to see it succeed but not for myself," he says. "I think it would be ..."